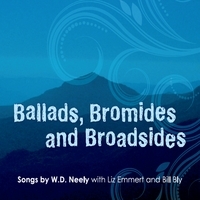 Ballads, Bromides and Broadsides is now available on CD Baby, iTunes and Amazon. This is a new collection of my tunes, featuring vocals by Liz Emmert and Bill Bly and an instrumental ensemble of Doug Miles (alias Curmudgeon Boy) on lead guitar, Steve Holley on drums, and Mark Dann on bass. The project was recorded, mixed and mastered by Mark Dann at his recording emporia in lower Manhattan and Woodstock, NY. You can listen to all of the new recordings for free here on the website, then link to CD Baby, iTunes and/or Amazon to purchase the CD or download individual tracks. While you’re here, visit the Songs page where I’ve posted more of my songs, including many of the tracks recorded by Left Field. And please share the site with friends if you approve of this sort of thing.